Business Directors are accountable for developing business goals and objectives. Working in variety of industries, these business directors take charge of the following roles and responsibilities – designing business plan, executing programs and plans, coordinating business personnel and operations, supervising and training employees, analyzing business data, gathering data, writing reports, monitoring company performance, developing and maintaining client relationship, identifying potential business partners, negotiating agreements and ensuring alignment of business goals. Business directors are expected to possess and depict all through the Business Director Resume attributes such as – a thorough understanding of various business processes and strategies, excellent knowledge of MS Office, information system, databases; familiarity with industry’s best practices, experience in developing business plans, excellent leadership and negotiation skills. While a Bachelor’s degree is considered mandatory for this position, portraying a Master’s degree will be advantageous. 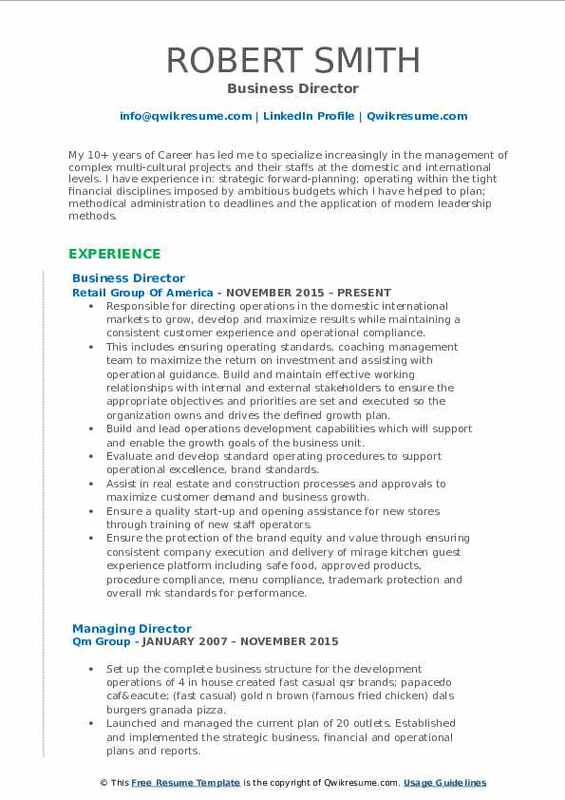 Summary : 10+ years experienced Business Director with a demonstrated history of working in sales and learning Development. Skilled in coaching, sales development, Sales Management, and event Management, Strong Business development professional. Oversaw sales and operations for up to twelve health clubs in the massachusetts, rhode island and connecticut markets. Surpassed assigned revenue and ebitdar budgets of $15-$20 million for each of the 4 years as a business director. Recruit, hire, develop and manage a high performing team including general managers, corporate account managers, sales consultants as well as additional staff in leadership positions. Responsible for driving sales and overall financial performance, ensure clubs meet and exceed all monthly sales target. Partnered with general managers to oversee performance management of their teams, provide coaching opportunities to ensure sales/retention and goals of all financial metrics. Communicated corporate initiatives to ensure clubs are properly trained to execute consistently. Lead acquisition projects including fitcorp: supported wellbride athletic club and hdc acquisitions. 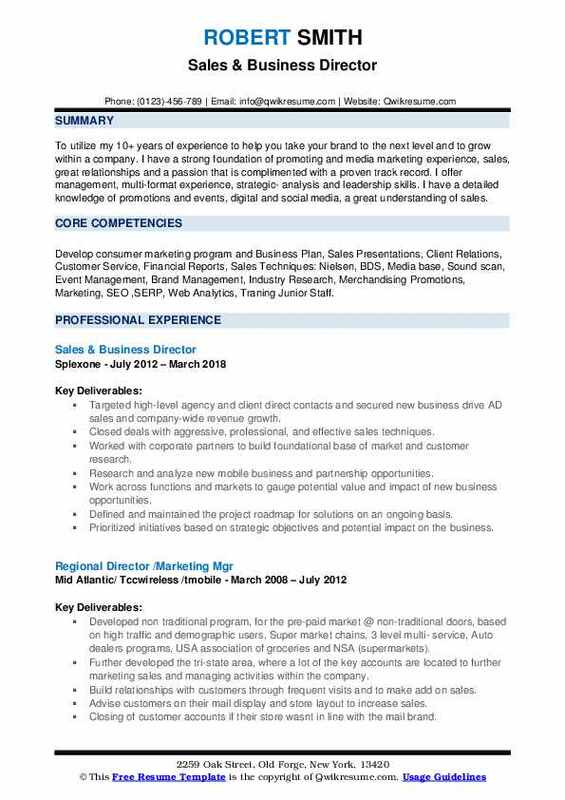 Summary : To utilize my 10+ years of experience to help you take your brand to the next level and to grow within a company. I have a strong foundation of promoting and media marketing experience, sales, great relationships and a passion that is complimented with a proven track record. I offer management, multi-format experience, strategic- analysis and leadership skills. I have a detailed knowledge of promotions and events, digital and social media, a great understanding of sales. 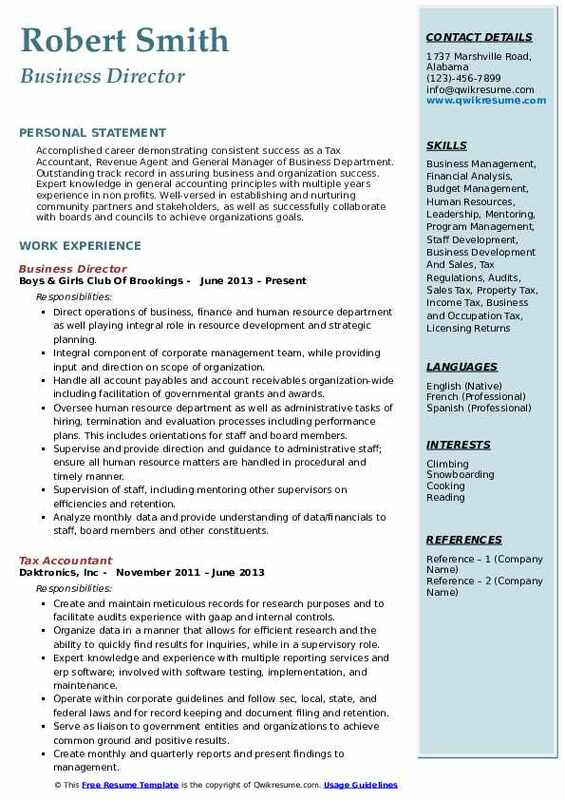 Skills : Develop consumer marketing program and Business Plan, Sales Presentations, Client Relations, Customer Service, Financial Reports, Sales Techniques: Nielsen, BDS, Media base, Sound scan, Event Management, Brand Management, Industry Research, Merchandising Promotions, Marketing, SEO ,SERP, Web Analytics, Traning Junior Staff. Targeted high-level agency and client direct contacts and secured new business drive AD sales and company-wide revenue growth. Closed deals with aggressive, professional, and effective sales techniques. Worked with corporate partners to build foundational base of market and customer research. Research and analyze new mobile business and partnership opportunities. Work across functions and markets to gauge potential value and impact of new business opportunities. Defined and maintained the project roadmap for solutions on an ongoing basis. Prioritized initiatives based on strategic objectives and potential impact on the business. Supported the development of detailed business cases for initiatives included on the global mobile strategic roadmap. Interface with various team members (e. G. , business owners, it, vendors) to identify and document the full business value justification and costs of the project. 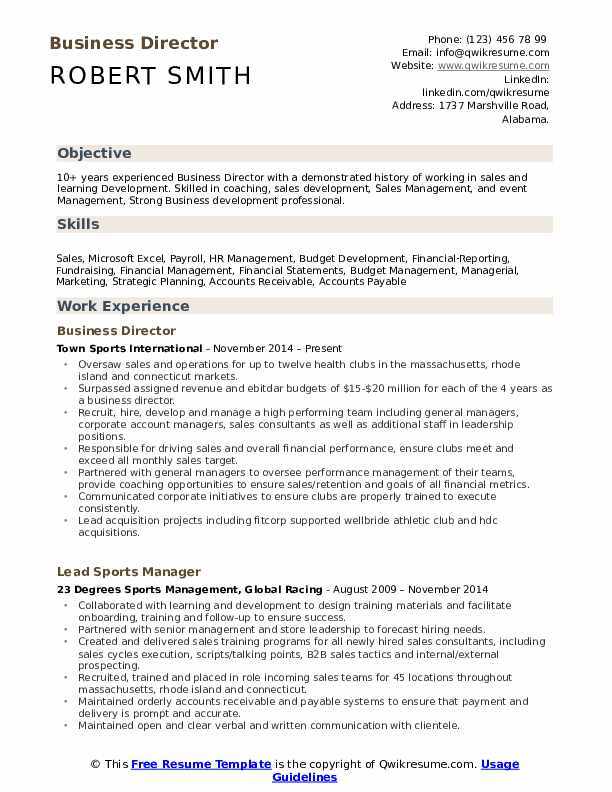 Summary : Administrative Manager of 17 years of experience who is well organized and focused, leading teams by providing direction, implementing plans and motivating others. Facilitate operational business development and create cohesive business units by providing financial management and administrative leadership to multiple departments. Plan, direct and implement financial and grant management, and human resource activities including managing facilities and space planning. 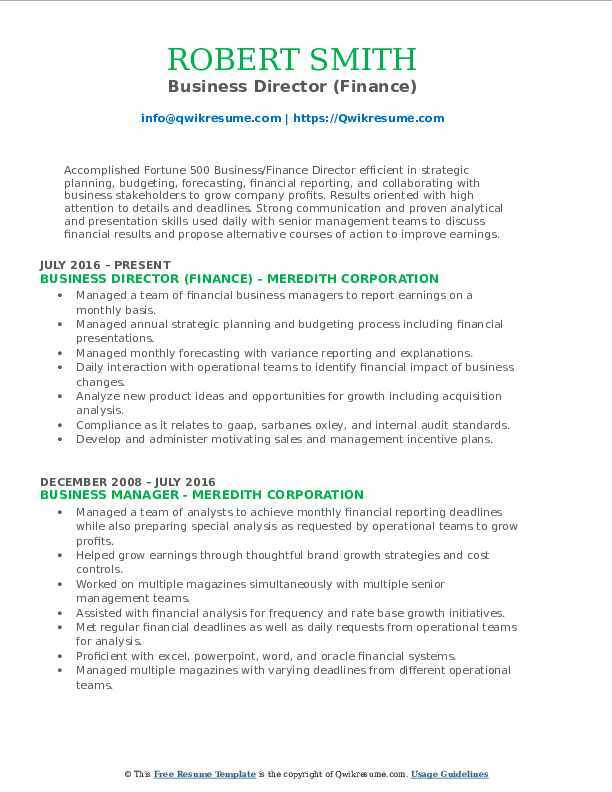 Skills : Administrative Leadership, Strategic Planning, Space Planning, Grant Management, Financial Management, Sales, Microsoft Excel, Payroll, HR Management, Budget Development, Managerial, Marketing, Accounts Receivable, Accounts Payable, Human Resources . Reported to vice president, clinical research operations supporting 7 departments totaling 110 employees and managed $11 million departmental budgets and $15 million grant funding. Collaborated with vice president and department directors creating and implementing strategic plans by capturing workload assessments, monitoring dashboards and measuring statistical success. Lead and directed recruitment, job and status changes to maintain low turnover and maintain high morale for staff. Served as a liaison between directors and human resources to facilitate organizational flow within corporate guidelines and in a timely manner. Analyzed clinical trial data, categorized the data according to nih guidelines creating protocol portfolios for multiple cancer programs. Investigated needs and requirements totaling $26 million and created fiscal budgets based on the needs and requirements which resulted in manageable and attainable fiscal budgets. Managed analysts and clerical staff ensuring staff provided first-rate performance to business unit. Researched data, analyzing and preparing reports to allow recipients to view program progress. Applied workload assessment and created staffing reports to show activity within a program. Developed and organized orientation packet and met with new hires to meet compliance regulations. Summary : My 10+ years of Career has led me to specialize increasingly in the management of complex multi-cultural projects and their staffs at the domestic and international levels. I have experience in: strategic forward-planning; operating within the tight financial disciplines imposed by ambitious budgets which I have helped to plan; methodical administration to deadlines and the application of modern leadership methods. Responsible for directing operations in the domestic international markets to grow, develop and maximize results while maintaining a consistent customer experience and operational compliance. This includes ensuring operating standards, coaching management team to maximize the return on investment and assisting with operational guidance. Build and maintain effective working relationships with internal and external stakeholders to ensure the appropriate objectives and priorities are set and executed so the organization owns and drives the defined growth plan. Build and lead operations development capabilities which will support and enable the growth goals of the business unit. Evaluate and develop standard operating procedures to support operational excellence, brand standards. Assist in real estate and construction processes and approvals to maximize customer demand and business growth. Ensure a quality start-up and opening assistance for new stores through training of new staff operators. Ensure the protection of the brand equity and value through ensuring consistent company execution and delivery of mirage kitchen guest experience platform including safe food, approved products, procedure compliance, menu compliance, trademark protection and overall mk standards for performance. Responsible for instruction of key guest experience and sales building programs (marketing, promotions, gaming and digital platforms). Identify revenue opportunities to ensure maximization of food and beverage revenues and profits. Review and approve menu adaptation recommendations. Identify and remedy cost deficiencies where they exist. In conjunction with the director of operations, establish visitation cycles, store evaluations, oversee the adherence to training requirements and materials. Headline : Accomplished career demonstrating consistent success as a Tax Accountant, Revenue Agent and General Manager of Business Department. Outstanding track record in assuring business and organization success. Expert knowledge in general accounting principles with multiple years experience in non profits. Well-versed in establishing and nurturing community partners and stakeholders, as well as successfully collaborate with boards and councils to achieve organizations goals. Direct operations of business, finance and human resource department as well playing integral role in resource development and strategic planning. Integral component of corporate management team, while providing input and direction on scope of organization. Handle all account payables and account receivables organization-wide including facilitation of governmental grants and awards. 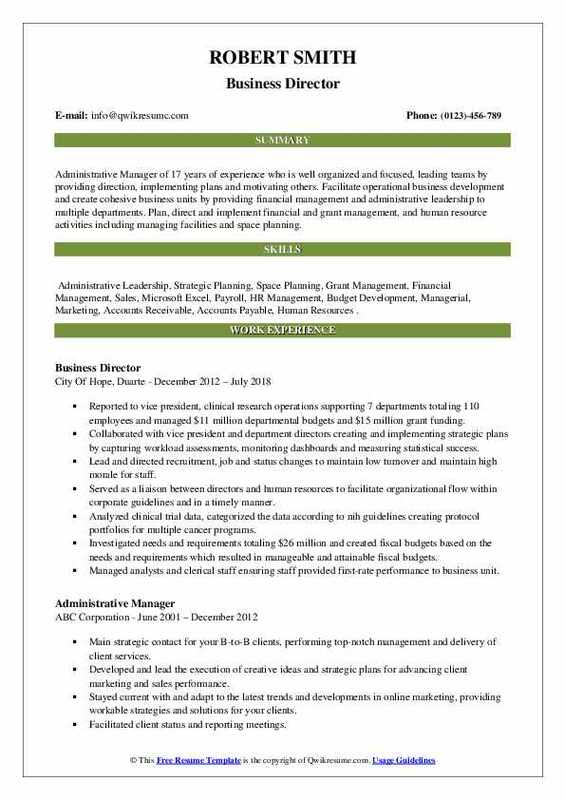 Oversee human resource department as well as administrative tasks of hiring, termination and evaluation processes including performance plans. This includes orientations for staff and board members. Supervise and provide direction and guidance to administrative staff; ensure all human resource matters are handled in procedural and timely manner. Supervision of staff, including mentoring other supervisors on efficiencies and retention. Analyze monthly data and provide understanding of data/financials to staff, board members and other constituents. Prepare annual budgets for multiple units and multiple campaigns in excess of $4 million dollars, including capital, endowment, and operating campaigns. Present budgets to boards and councils and facilitate discussion to balance budget; research and prepare monthly financial reports for five entities. Offer input and develop revisions, updates, and new policies and procedures as opportunities arise. Ensure staff have the tools and guidance to facilitate and succeed within organizational policies and procedures. Facilitate processes and possess comprehensive understanding of benefits, payroll taxes and various tax implications encountered in payroll process. Provide analysis and guidance in regards to financials, human resource, and payroll for entire organization, spanning multiple units. 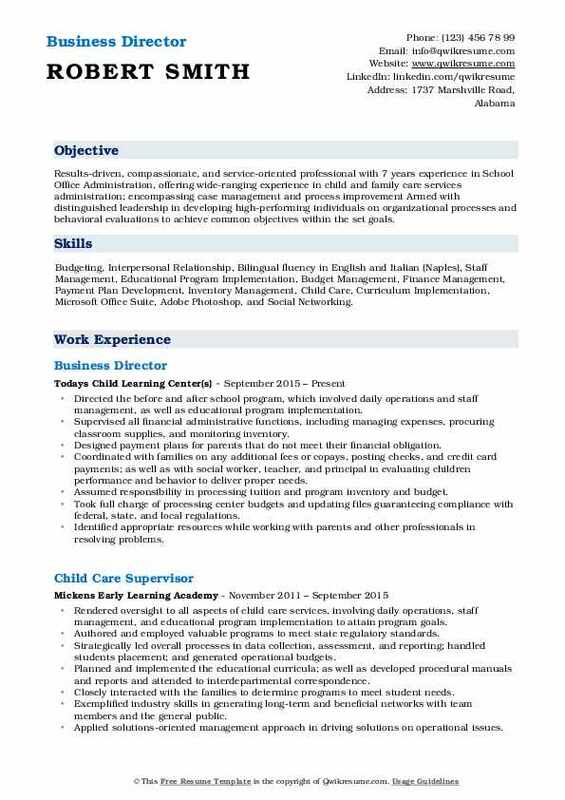 Headline : Results-driven, compassionate, and service-oriented professional with 7 years experience in School Office Administration, offering wide-ranging experience in child and family care services administration; encompassing case management and process improvement Armed with distinguished leadership in developing high-performing individuals on organizational processes and behavioral evaluations to achieve common objectives within the set goals. 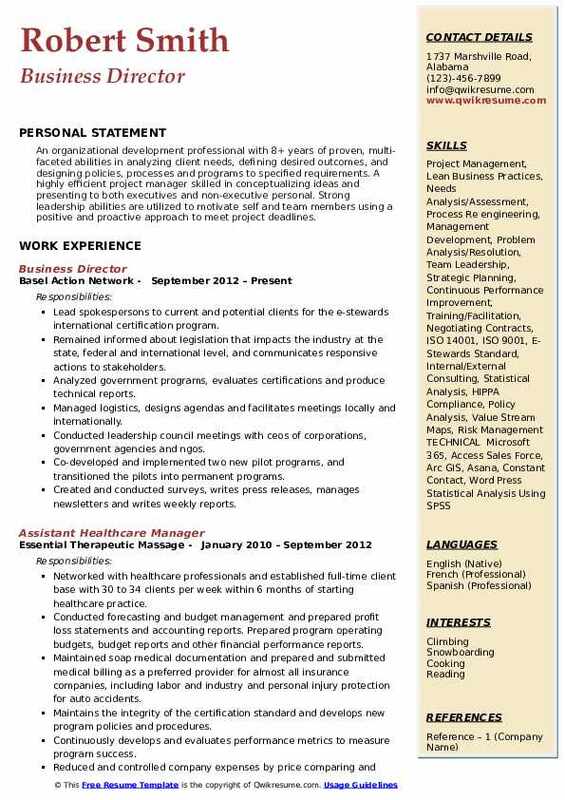 Skills : Budgeting, Interpersonal Relationship, Bilingual fluency in English and Italian (Naples), Staff Management, Educational Program Implementation, Budget Management, Finance Management, Payment Plan Development, Inventory Management, Child Care, Curriculum Implementation, Microsoft Office Suite, Adobe Photoshop, and Social Networking. Directed the before and after school program, which involved daily operations and staff management, as well as educational program implementation. Supervised all financial administrative functions, including managing expenses, procuring classroom supplies, and monitoring inventory. Designed payment plans for parents that do not meet their financial obligation. Coordinated with families on any additional fees or copays, posting checks, and credit card payments; as well as with social worker, teacher, and principal in evaluating children performance and behavior to deliver proper needs. Assumed responsibility in processing tuition and program inventory and budget. Took full charge of processing center budgets and updating files guaranteeing compliance with federal, state, and local regulations. Identified appropriate resources while working with parents and other professionals in resolving problems. Directed the two school age programs and centers for 50 children aged 5 to 12 years old. Developed and implemented continuous improvement workshops, which significantly enhanced staff performance. Partnered with internal and external child development services for children ages 5 to 12 to preserve and uphold the organizations mission. Identified five kindergartener with attention-deficit/hyperactivity disorder (adhd) and relayed traits and behaviors to parents, and recommended children for evaluation. Steered efforts in administering educational and counseling activities in line with changing student improvement. Summary : Accomplished Fortune 500 Business/Finance Director efficient in strategic planning, budgeting, forecasting, financial reporting, and collaborating with business stakeholders to grow company profits. Results oriented with high attention to details and deadlines. Strong communication and proven analytical and presentation skills used daily with senior management teams to discuss financial results and propose alternative courses of action to improve earnings. Managed a team of financial business managers to report earnings on a monthly basis. Managed annual strategic planning and budgeting process including financial presentations. Managed monthly forecasting with variance reporting and explanations. Daily interaction with operational teams to identify financial impact of business changes. Analyze new product ideas and opportunities for growth including acquisition analysis. Compliance as it relates to gaap, sarbanes oxley, and internal audit standards. Develop and administer motivating sales and management incentive plans. Worked on the acquisition team for 3 new acquisitions within the last 3 years. More than doubled profits within first year of acquisition. Implemented and developed new financial system with budgeting and forecasting tools. Present strategic planning financial information annually to senior management. Proactively recommended potential cost savings and revenue growth opportunities. Great working relationships with senior management teams who trusted my advice. 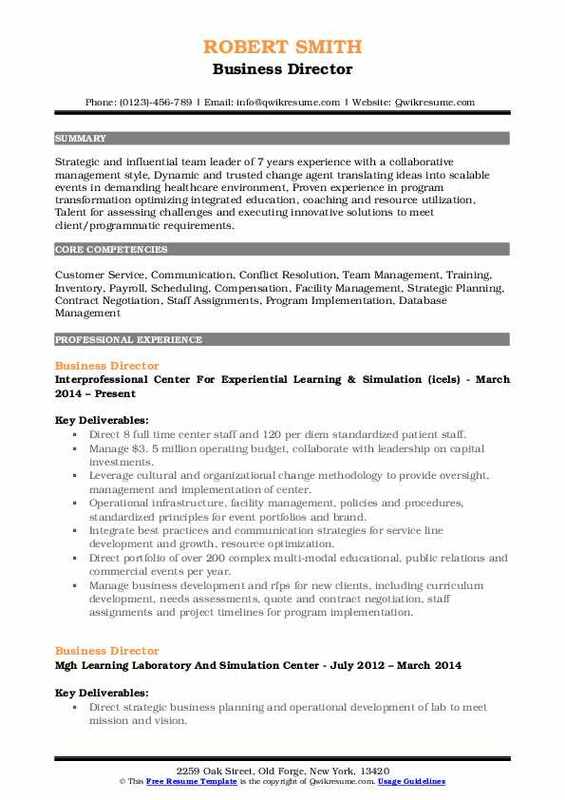 Headline : Strategic and influential team leader of 7 years experience with a collaborative management style, Dynamic and trusted change agent translating ideas into scalable events in demanding healthcare environment, Proven experience in program transformation optimizing integrated education, coaching and resource utilization, Talent for assessing challenges and executing innovative solutions to meet client/programmatic requirements. Direct 8 full time center staff and 120 per diem standardized patient staff. Manage $3. 5 million operating budget, collaborate with leadership on capital investments. Leverage cultural and organizational change methodology to provide oversight, management and implementation of center. Operational infrastructure, facility management, policies and procedures, standardized principles for event portfolios and brand. Integrate best practices and communication strategies for service line development and growth, resource optimization. Direct portfolio of over 200 complex multi-modal educational, public relations and commercial events per year. Manage business development and rfps for new clients, including curriculum development, needs assessments, quote and contract negotiation, staff assignments and project timelines for program implementation. Facilitate icels core demonstration for umms chancellors media fellowship, liaison with umms communications office for high profile interviews, photo shoots, and other visible media opportunities. Strategic engagement of multi-faceted recruitment, retention, onboarding and staff training protocols. Successful implementation of web-based invoicing and expense tracking tool, and program request/rfp database. Summary : An organizational development professional with 8+ years of proven, multi-faceted abilities in analyzing client needs, defining desired outcomes, and designing policies, processes and programs to specified requirements. A highly efficient project manager skilled in conceptualizing ideas and presenting to both executives and non-executive personal. Strong leadership abilities are utilized to motivate self and team members using a positive and proactive approach to meet project deadlines. Lead spokespersons to current and potential clients for the e-stewards international certification program. Remained informed about legislation that impacts the industry at the state, federal and international level, and communicates responsive actions to stakeholders. Analyzed government programs, evaluates certifications and produce technical reports. Managed logistics, designs agendas and facilitates meetings locally and internationally. Conducted leadership council meetings with ceos of corporations, government agencies and ngos. Co-developed and implemented two new pilot programs, and transitioned the pilots into permanent programs. Created and conducted surveys, writes press releases, manages newsletters and writes weekly reports. Performed website maintenance to ensure critical program changes are updated within 24 business hours. Formulateed annual budget forecasts and strategic plans, then monitors and reports on status. Networked, cultivated and preserved partnerships in the industry to increase expansion and growth of the program.